With a little luck and patient scheduling, the majority of extended cruises should feature plenty of off-the-wind work. While standard working sails are fine when the wind is forward of the beam, they are less than ideal at wind angles greater than 90 degrees apparent. Their small size, heavy construction, and the fact that they get blanketed behind the mainsail make them less than ideal tools for the job. That’s why all cruisers should travel with an asymmetrical spinnaker – the perfect sail for downwind fun. The classic approach to downwind cruising has been to add a cruising spinnaker. Traditionally that meant a relatively heavy (usually 1.5 oz.) nylon sail with a foot length between 1.65-1.8 of the J (the fore-triangle length from the base of the mast to the forestay) and a mid-girth (width halfway up the sail) of 90-95 percent of the foot length. Designed for the tack to be set at a fixed point on the bow, the shaping was similar to a symmetrical spinnaker with the leech shortened so that the sail had a distinct luff and leech. This got rid of the pole, and ­– voila – the asymmetrical spinnaker. In the last decade or so, cruising sails optimized for downwind performance have come a long way. Cruising sailors now have a range of options when buying an asymmetrical spinnaker. Let’s take a look. Runner – equal to or greater than the foot. Moderate reacher – 90 percent of the foot. Code Zero – 60-70 percent of the foot. To support girth you must add depth or the sail will just flutter, so remember: bigger equals deeper. On a cutter with a big fore-triangle (the J), using a 180 percent multiplier to determine foot length gets you a big sail, maybe too big to handle conveniently. Conversely, on a boat with a small J (fractional rigs and modern mastheads), the bigger multiplier may be required to give the sail enough power. Many cruising boats are adding bow sprits, which open up options even further. With a sprit, the only limitation on size might be the aspect ratio, or height versus width. You don’t want to get too tall and skinny or too wide and stubby. Proportion is important to the sail’s performance. Another design consideration is how the area is balanced between luff and leech, specifically how much is placed forward of the straight-line luff. Asymmetricals for running have plenty of positive area forward of the straight luff that can rotate around to weather of the centerline when the sheet is eased (this allows the sail to project from behind the mainsail). To optimize for closer reaching angles this area is reduced. A Code Zero or reacher (multihull version of the Zero) might have virtually no forward area and be straight (or even hollow), like a genoa. Then there’s boat speed. The higher the speeds a boat is capable of, the further forward it pulls the apparent wind. Longer boats go faster. Some modern designs, especially on the cruising multihull side of the equation, are getting quite fast. This means the smaller, flatter designs will work well. On a typical moderate displacement design of medium size, the apparent wind angles are usually wider, so there’s more need for bigger and fuller. What does the rest of your sail inventory look like? If a big, overlapping genoa is the primary working headsail, that will cover closer reaching angles up to a beam reach and even a little aft. If the primary working sail is a small, non-overlapping jib or self-tacker, the boat is going to need help as soon as the sheets are eased. Sail fabric weight depends on boat size. Assuming that a cruising sailor will not be using the sail in more than 20 knots apparent, lighter weights make sense for the A2 and A3 asymmetricals. Lighter fabric will help the sail fly in the target range and make the sail much easier to store and handle. At the other end of the spectrum are the small, flat, genoa-like sails, like the Code Zero. Basically a reaching genoa, the foot lengths are shorter, at 150-165 percent of the J. The girths are in the 55-70 percent range, the shape is flat, and luff projection is minimal. Optimum apparent wind angles are usually 50-120. For this sail, fabric weight must be stronger. These sails often require specialized composite materials, as nylon has too much stretch. Handling systems come down to a choice between spinnaker socks and top-down furlers. Socks are simple and work well, particularly on spinnakers with big girths. Top-down furlers work well on smaller, flatter sails, but can struggle as the sail’s girth get bigger. Big width up high is tough to furl tightly and reliably. Top-down furlers also need clearance between the headstay and furled sail. If you prefer top-down furlers, a sprit helps. So, which sail do you need? It comes down to the apparent wind angle you want optimize for. 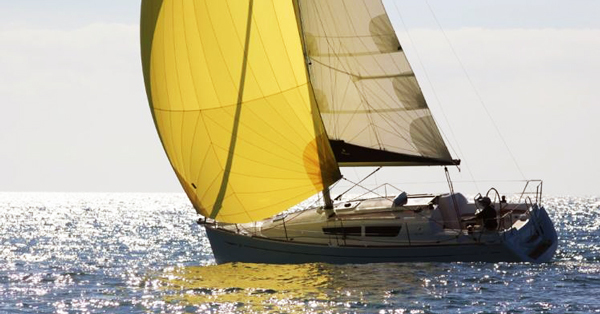 Most cruising sailors want simplicity – one sail to do it all. That means a middle-of-the-road asymmetrical, for apparent wind angles of 80-140. Go for a moderate overall size with a girth in the 90-95 percent range and moderate depth and projection forward of the straight line luff. This is what many sailmakers refer to as the A3 all-purpose reaching sail. If you want to optimize for broad reaches and apparent wind angles of 110-155, go bigger and consider a sprit. With 180 percent foot length and 100 percent mid-girth and lots of shape and luff projection, this is your A2 sail. What would be my dream, no-budget inventory for downwind sailing? I’d have a big A2 runner in a sock for broad angles, and a Code Zero on a top-down furler for reaching (the Code Zero would replace the big, overlapping genoa allowing me to use a small, easily-handled, and more versatile headsail for upwind work). Both would set on a sprit.